Since their “Christianity Is Stupid” track on the 1987 album Escape From Noise, religion, and its monolithic communication, has been a topic for Negativland band, who return after six years with this “multimedia” double album with new material. “It’s All in Your Head”, they say, “intends to entertain, inform, and provoke.” Nothing new there. The two CDs are mounted in transparent sleeves on the inside covers of a classic King James Bible. 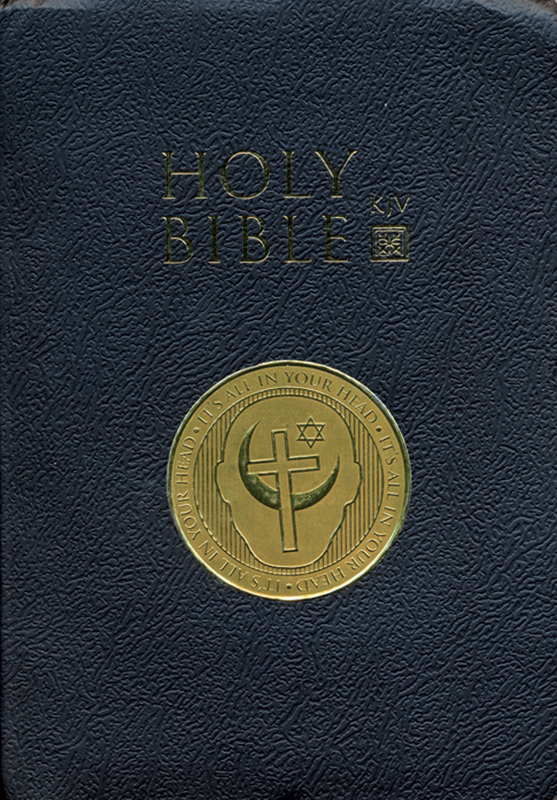 Furthermore, the Bible’s cover sports an embossed gold sticker, with a head profile comprising a mix of the three major religious symbols, where the star in the Islamic “Star and Crescent” has been replaced by a Star of David, while a Christian cross intersects the crescent. It’s a universal physical interface to communicate with God used as a found object, inoculated with Negativland symbols and music, but leaving the text intact. Their main question for this work (“why do people believe in God?”) is addressed in the two CDs (“Act I” and “Act II”). These are, in their trademark Negativland style, as if they were two unreleased tracks from their weekly radio show “Over the Edge.” With an announced limited edition packaged inside the Qur’an, the only missing piece here would be an invitation to leave this work into some hotel bedside table drawer, replacing a plain bible and hoping that it would make a difference for the next guest.